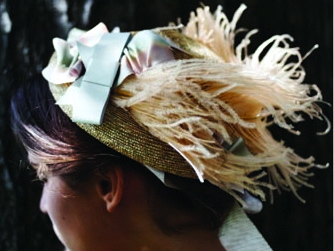 Considering the visual feast of fancy hats and caps we've been watching all morning on today's Royal Wedding coverage, we feel particularly fortunate that the lovely ladies behind New York's own Yestadt Millinery, Jane Pincus and Molly Yestadt, have shared their spring style inspiration. Unsurprisingly, hats play an important role in their May mood board (including traditional Vietnamese cone caps), but so do ice cold sodas, floral patterns—even an exhibit at The Natural History Museum. 1- Vietnamese Hat - "This Vietnamese woman has so much swag it's unbelievable. The traditional hat creates a real aura around her. We have been told that this could also be interpreted as a non-smoking ad." 2- Brush Costumes - "This is a little picture Molly took at the Museum of natural history in the brush costume section. The texture and bulk of the straw is interesting paired with the tall pompom mask. I like to pay a visit to him when ever I make it up there." 3- Vintage Black & White Photo - "This is what summer should look like...ice cold soda and white linen pantaloons. All they need is a glamourous sun hat!" 4- Jack Pierson florals - "This series of photographs really emote that hot summer fauna feeling for me. The composted fruit and flowers speak to that rich seasonal color story." Find Yestadt MIllinery's jubilant spring caps at Henri Bendel and Barney's CO-OP.